Combine the first 8 ingredients in a medium saucepan. Bring to boil, stirring to dissolve sugar. Remove from heat and let cool for about 30 minutes. Once cool, slice the shallots into julienne and place in a bowl with some of the pickling juice. Preheat the oven or toaster oven for 450°. Line a rimmed sheet pan with foil. Stand the marrow bone upright with the widest end of the bone on the bottom. Roast for 15-20 minutes. Scoop out the marrow onto toasted baguette. Sprinkle with flaky salt, lightly dress with lemon and top with pickled shallots and parsley. This entry was posted in appetizers, entree, lunch, recipes, sides by MixedSoup. Bookmark the permalink. Hi Carmela, I’m not sure exactly what you are looking for, but from what I read of your comment you (like me) would like to be shown more theory and culinary techniques (as well as some science behind what’s happening?). In that case I would not recommend so much Gastronomicom. You may want to check out schools more like Cordon Bleu or Culinary Institute of America (which I like). There is another option that is less professional, but longer hours than Gastronomicom in Ireland which I’ve attended called The Ballymaloe Cookery School. That 3 month course is also on this website. It’s all a matter of what you’re looking for. You want professional, go…and pay for professional. If you want to improve your skills a bit, have fun and learn some new things, then go with a second tier school. Hope this helps! Good luck, great adventures await you!! Cheers! Thank you !! This has definitely shed some light 🙂 And as to what I’m looking for, well I really want to get a cook job in a restaurant in Vancouver or a different country after this course. I am looking at Gastronomicom’s full program which includes a 4 months internship program in a hotel. I thought that the first 3 months will be spent learning and applying the basic foundations then the 4 months internship would be to hone my culinary skills. I thought that the full program is aimed to those who want to be a professional cook. I’m still in Vancouver right now doing research and I am also going to do some volunteer work in community kitchens to learn. I would really like to go back to France and complete my studies there but my budget is just around the tuition of Gastronomicom. I’ve looked at Cordon Bleu and CIA but both are very pricey for me. Ballymaloe looks good and has more information available in their website but it is still out of my budget. Thanks again for your advice!! If you have any more please send them my way. 🙂 Happy cooking !! oops! Yes!!! I forgot about the internship. Once you complete that you definitely would be ready for restaurant work. Go for it – you’ll have a great time! I love this! 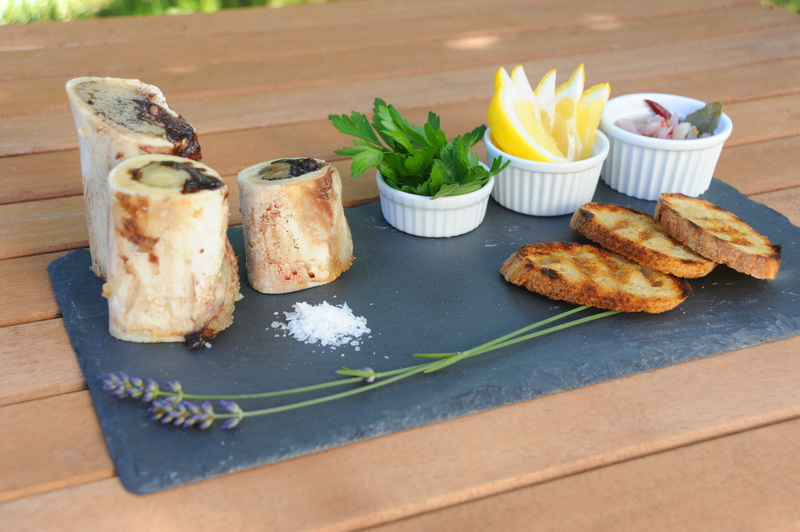 I rarely see a blog tackle bone marrow but it’s such a delicious treat. Thanks Jen – hope you get a chance to try it…it is decadent!